We've had a ton of questions about where to buy the succulents that are frequently used throughout the exterior of the homes we have designed. We found this great website that has a beautiful selection of succulents, all materials are environmentally friendly, and they ship throughout the United States! Visit www.succulentla.com. Succulents are a great addition to any landscaping, as they are not only stunning, but they require very little attention and maintenance. To keep your succulents at their best, all they need is a little sunlight (can be indirect) and light watering every 2-5 weeks. They are one of the few plants where less attention is actually better! See the images below for a few ways we have incorporated succulents into our design projects. 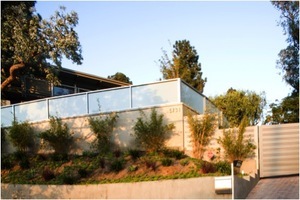 We recently finished a project in Franklin Canyon that was in need of some TLC in the landscape department. The property is on a hillside with some rocky terrain that we had to work around. In order to create a united look, we opted for uniformity in color and chose about five or six different plants that do not need a lot of water and fill in quickly such as bamboo, flax, and sedum ground cover. 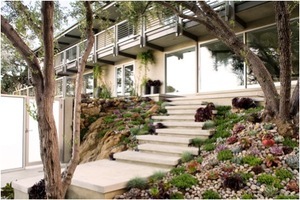 The rocky terrain near the front steps allowed us to utilize succulents and river rock to create a zen inspired garden, inviting you to the front door. Succulents come in a variety of shapes and colors and also do not require a lot of water. They are slightly more expensive than other plants, but also make a dramatic visual impact. 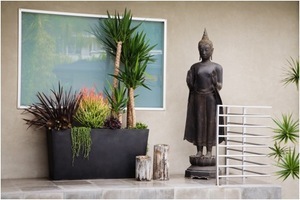 To finish off the landscaping, we like to mimic the same look by adding potted succulents in different heights and textures, as shown in this zinc planter.